The average FB-user has 229 friends, of which 22% are from high school, 12% are co-workers, 9% are from college and 3% are met once. In 2008 the average user was 33. Two years later, the average user was 38, five years older. More info via the link below. 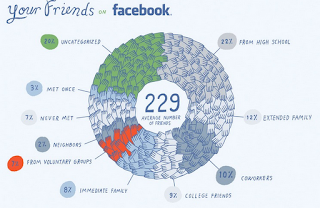 Who Is an Average Facebook User?